It's reveal day at Studio Calico!!! This is my first official reveal day and I'm super excited (and a bit nervous, lol!). You probably already know this, but the release will be available for subscribers right now and will be available to everyone at midnight. Today, I'll be sharing my projects using the Copper Mountain Card Kit and the Spaulding Bowl Add-on! 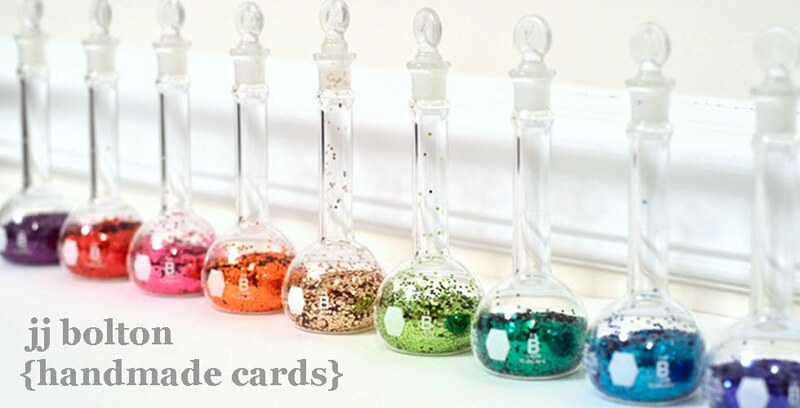 I'm doing it backwards today and starting with my Spaulding Bowl Add-on cards first! 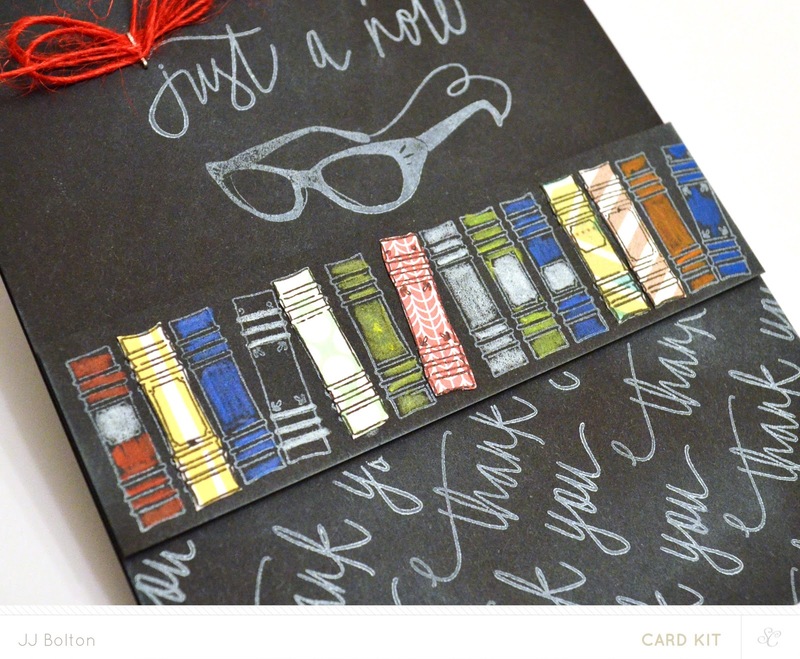 This add-on comes with the cutest book-themed stamp kit (I love anything book-related:). 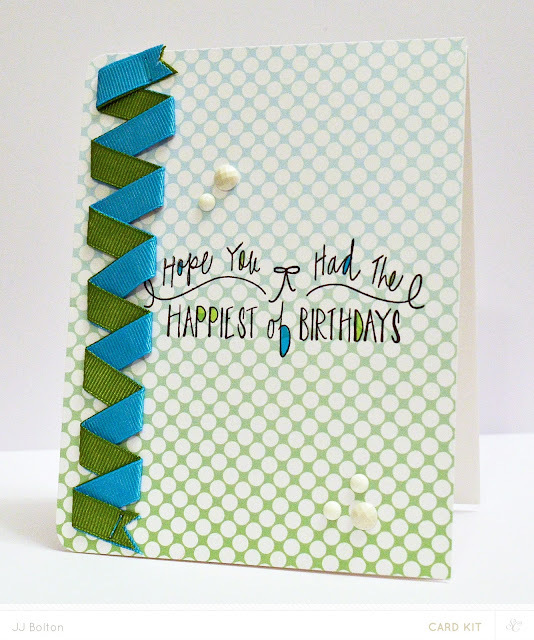 For this card, I used the beautiful ombre paper and gave it a matching ribbon treatment. 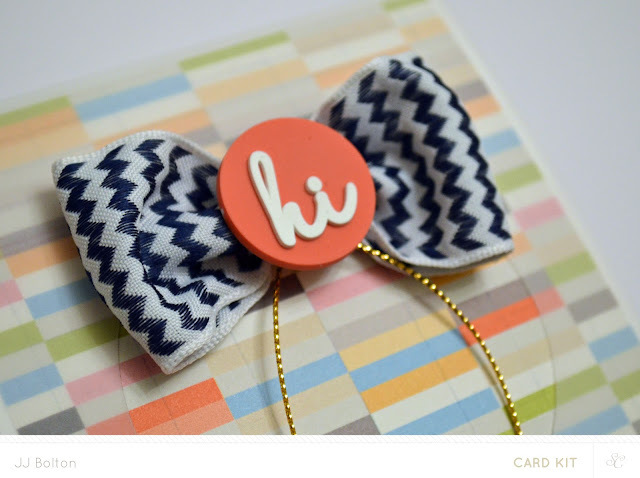 To create the ribbon border, I layered 2 pieces of ribbon and stapled them to the card with my tiny attacher. I love the two-tone look! A tip for using the tiny attacher, color the staples with markers (Copics work very well). A fun little detail! My second Spaulding Bowl Add-on has a totally different look:) I still love the whole chalkboard thing and the handwritten look of the stamps work great with this style. The book border was created by paper piecing some of the books and using colored pencils on the rest. Colored pencils are great for working with dark papers. Now for my Copper Mountain Card Kit projects:) I'm a big fan of bright colors and graphic shapes, so I couldn't resist this beautiful paper in the kit! Gorgeous, right? For a little bit of fun, I added a layer of vellum over the patterned paper. I'm loving the navy chevron ribbon with that adorable embellishment. Just too cute! This last card is my fave! The Copper Mountain Card Kit includes a super cute nautical themed stamp set that comes with a...wait for it..coordinating die set!!! How cool is that? Of course, when my package came I grabbed those stamps and dies straight away and created this! 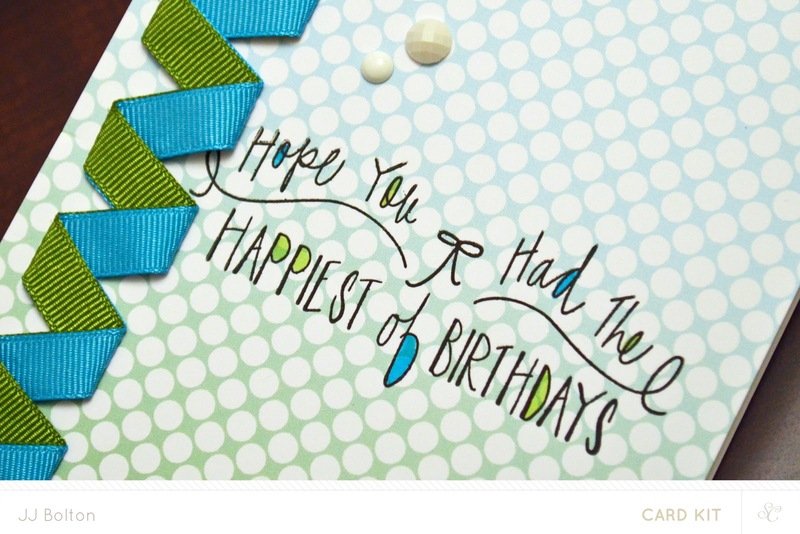 To create a 3D look, this card has 3 layers, the base, the raised panel, and the popped up die cuts. The dies are the key to the 3 layered look! I blended ink over the background to achieve the underwater look but each of the fish are colored with Copic markers (the blender pen is great for making that splotchy look). I love that the fish can be flipped either way! Now you're probably wondering to yourself, "hey, the kit doesn't come with a whale outline stamp!" You're totally right! 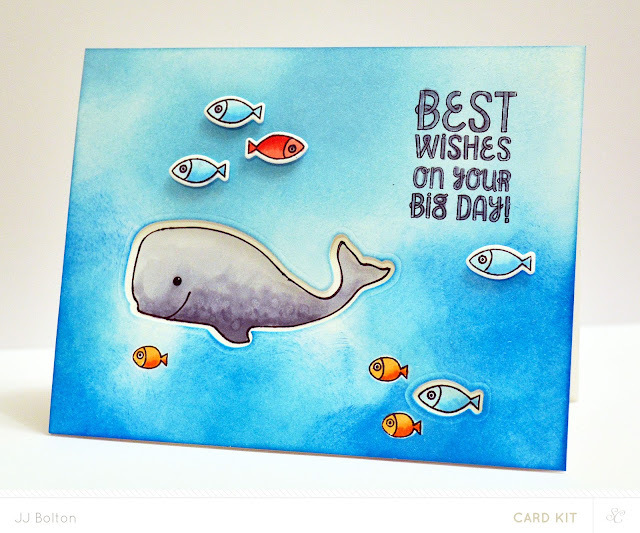 To create the whale "stamp", I used the whale die as a stencil. I just took a regular old Memento marker and traced along the inside of the die. Totally looks like a stamp, right? Using the same marker, I drew in a mouth and the eye is just an enamel dot. So for all you folks who don't have a manual die cutter, this is a great way to use your dies! Thank you, thank you, thank you for stopping by! I hope you have a wonderful Friday and weekend!! Great debut JJ! I love these, I think that the third one is so fun and funky, and I LOVE how you used the die as a stencil for the last one, but my fave is the chalkboard. 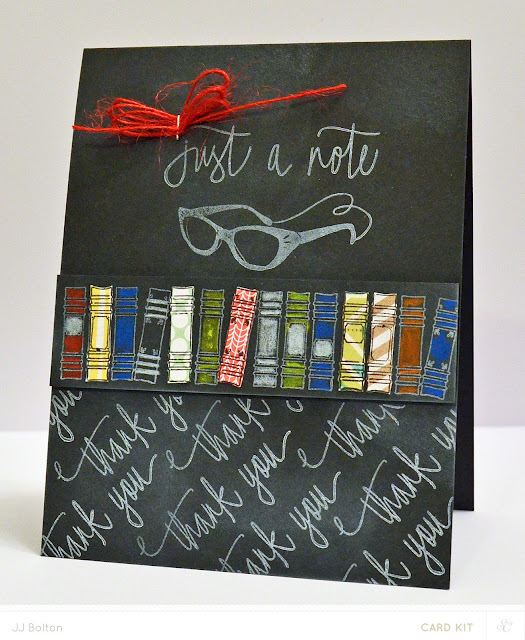 Great stamping and I love the mix of piecing/coloring on the books! They are all fabulous, but my favorite is the layered ribbon one at the top. That is such a great idea and a good way to use up some of my ribbon stash without adding a lot of bulk to the card like a knot or bow would. Did you adhere the ribbon pieces together first? Congrats on your first DT post with Studio Calico! I love every, single card too, JJ! Love your ribbon treatment, and how you colored in your alphas and books, not to mention all the beautiful inking and blending you did on your last card...so fun and fabulous...and so 'You'!!! yahoooooooooooooo!!! Excellent projects JJ! So.Much.Fun!!! Love them all! Great first reveal, JJ! Now, I can't wait to get my kits! 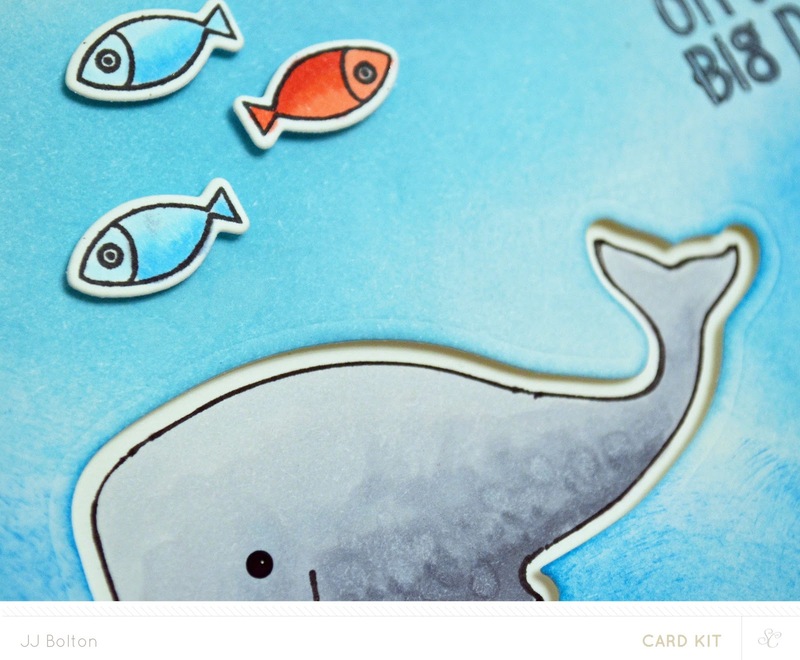 Okay using the inside of that whale die to draw an outline to mimic a stamp is GENIUS. Mind you, a genius is what you are! 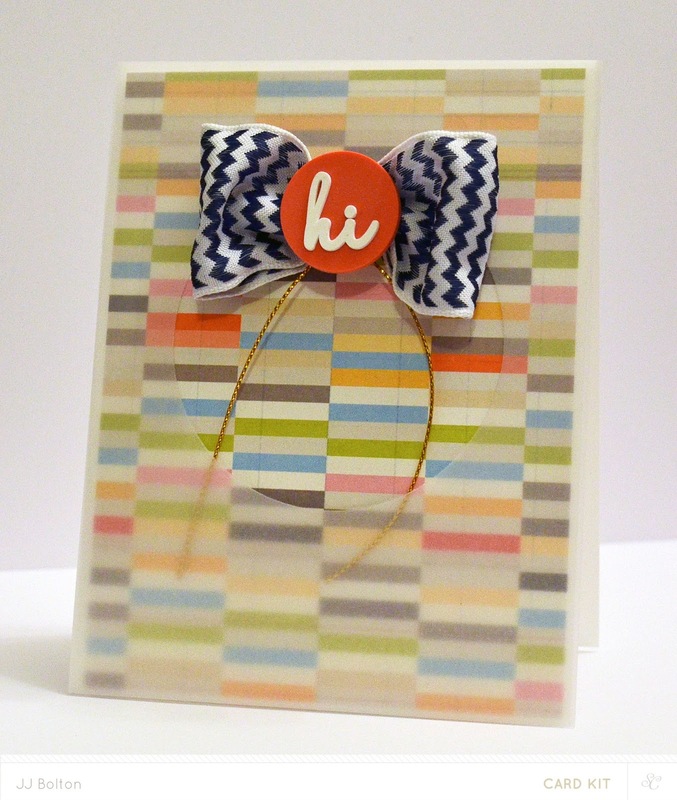 Great debit JJ, my favourite it the penultimate one, that bow on patterned paper with the hi embellishment is awesome!! I LOVE the first card! so neat...i love that ribbon! All your cards are special, but I had to clip the one with the ribbon. So creative the way you did that!